MANILA, Philippines - Thirty Sailors assigned to the forward-deployed aircraft carrier USS Ronald Reagan (CVN 76) participated in a community volunteer project with the Republic of the Philippines National Response and Logistics Management Service (NRLMS), June 28. 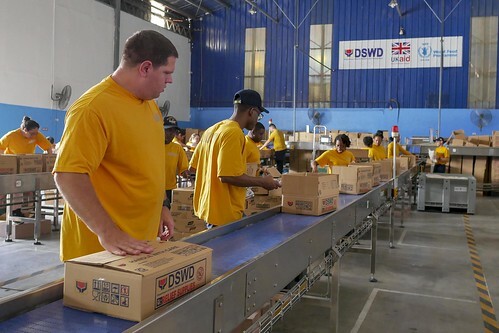 During the project, Sailors helped pack more than 3,000 boxes of food items to be delivered to victims of the January volcanic eruption at Mount Mayon. According to the U.N. Office for the Coordination of Humanitarian Affairs, the disaster resulted in the displacement of more than 90,000 people. “We rely solely on volunteers, so it is very important that we get this kind of support in order for us to be able to ship goods to victims in different areas affected by disasters,” said Byrone Barrionuevo, head of volunteer management for NRLMS. Legalman 1st Class Keia Greenwood, who volunteered to lead the project, said it was a rewarding experience on multiple levels. The project was one of eight community volunteer efforts coordinated by Ronald Reagan’s command religious ministries department. More than 200 Sailors volunteered during the ship’s scheduled five-day port visit. Ronald Reagan, the flagship of Carrier Strike Group 5, provides a combat-ready force that protects and defends the collective maritime interests of the U.S. and its allies and partners in the Indo-Pacific region.